The worst thing that can happen to you when visiting a city, is wandering around the main attractions, aimlessly and hungry, without knowing where to go. No need to fumble with the GPS and Tripadvisor any longer, if you’re headed to the Champs Elysees, here are 5 must eat at hotspots where you’ll find the finest cuisine in Paris. It might be tricky to pronounce but it’s definitely worth making the call to reserve a table at Komatsubaki. With a lovely backstory, this place is set where renowned Japanese restaurant Hyotan pulled in the crowds for thirty years. Now, reputed chef Kino is taking over with his protégée, Chef Takubo, to pass on his know-how before he retires. 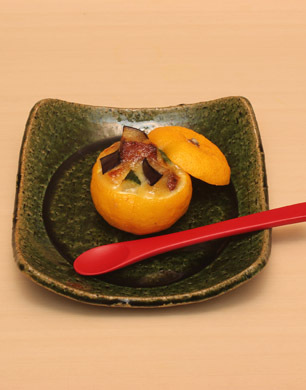 A meeting of tradition and creativity, it’s all about Komatsubaki cuisine, mixing Sushi and Kaïseki, a traditional classic or vegan Japanese cuisine. Spoil yourself with the 60 euro “Omakase” menu – which actually means “Chef, I rely on you” – it’s the best way to try new things and experience a culinary voyage like no other. Whether it’s fish, shellfish, seafood and vegetables, the subtle dishes are all more beautiful than the next. A true art, I was blown away by the plates – one after the other, from the delectable sushi to the blackened sweet cod, and daintily arranged exotic veggies. Who knew lady’s fingers sushi could be so tasty? A unique and memorable experience in an authentic décor where one is virtually transported to the land of the rising sun! Not quite typically Parisian, but sometimes it’s nice to try something new! An institution in Paris, Fouquet’s brasserie has been sitting pretty on the corner of the Champs Elysees and the Avenue George V since 1899. With historical ties to the arts and film industry, it’s a favourite for the French glitterati. 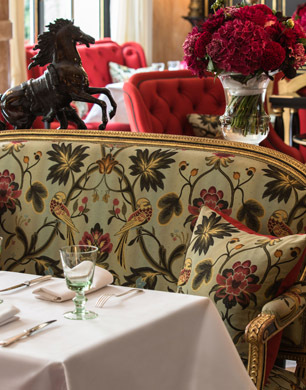 The iconic red awning and terrace has seen the ‘tout Paris’ sit down to lunch, dinner or drinks. For an authentic experience, book a table outside. It’s one of the most Parisian spots you’ll find and ideal for people watching. 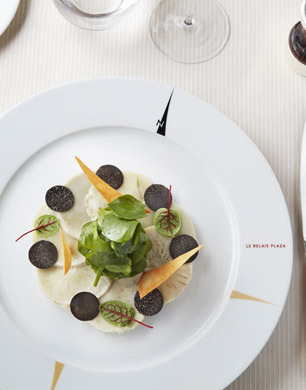 Star chef Pierre Gagnaire is in charge of the kitchen and offers a traditional brasserie menu with a twist. I plumped for a fabulous Tuna Tartare and a Foie Gras terrine with springtime chutney – the perfect French menu. My husband was more adventurous with a Squid and chorizo fried salad with cherry tomatoes and black olives followed by the Fouquet’s Tartare – a mix of raw herring, Roquefort cheese and beef! We were then tempted into trying the elegantly named Longchamp au Chocolat, which was explained as a ‘Twix maison’ by the waiter but oh-so-much more… Mr Gagnaire can be proud of this creation, a must for chocolate aficionados! If you fancy a plush hush-hush address, pop into the very chic La Réserve a stone’s throw away from the Elysee Palace. Definitely a place to rub shoulders with the better heeled Parisians, it’s also the spot to taste Chef Jérôme Banctel’s seasonal goodies amidst the velvet and the chandeliers. Don’t miss the copious and ultra tasty green beans and crab salad with a sesame seed sauce – utterly delectable and a meal in itself, even if it’s supposed to be a starter! Another must which works as a single meal? The Foie gras laqué au navet Daïkon caramelize – an indulgence worth the detour. Other classics on the menu include oysters, salmon carpaccio or scallops with Japanese rice and curry. 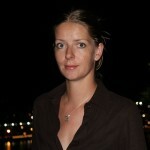 Keep an eye out for the political crème de la crème or fashionista celebs – even Victoria Beckham has been spotted here. Here’s one for those in the know. 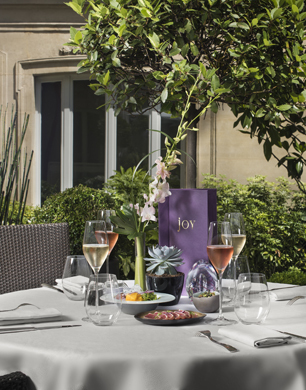 Tucked away behind the Champs Elysees, away from the hustle and bustle the M64 is a great hideaway from the crowds, and even better – it’s got a great affordable menu and a secret terrace to enjoy a meal ‘al fresco’. The daily menu, highly recommended, sets you back just 39 € for 2 courses, whether you prefer a starter and a main or a main and a desert for a real gastronomic indulgence. 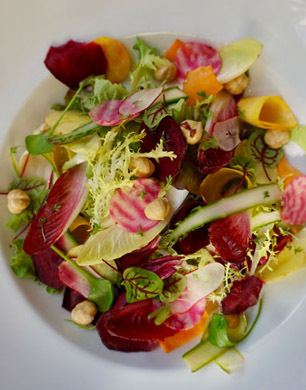 The restaurant’s new Chef, Cedric Douchin cooks only with fresh ingredients and everything is homemade. He plans to change the menu every month according to the season so if it’s still on the menu, try the “Oeuf mollet” or soft boiled egg with wild asparagus, poultry juice and parmesan – a treat for sophisticated palates. Next up came a Gambas risotto with chorizo foam – another melt in your mouth experience! Each dish was subtle, rich and full of taste while still feeling simple, each ingredient full of flavour. A fresh feast. And, last but not least, the creamy peanut butter and chocolate mousse was heavenly to me, as a peanut butter fan – and lighter than expected, which is a good thing after such a tremendous meal.